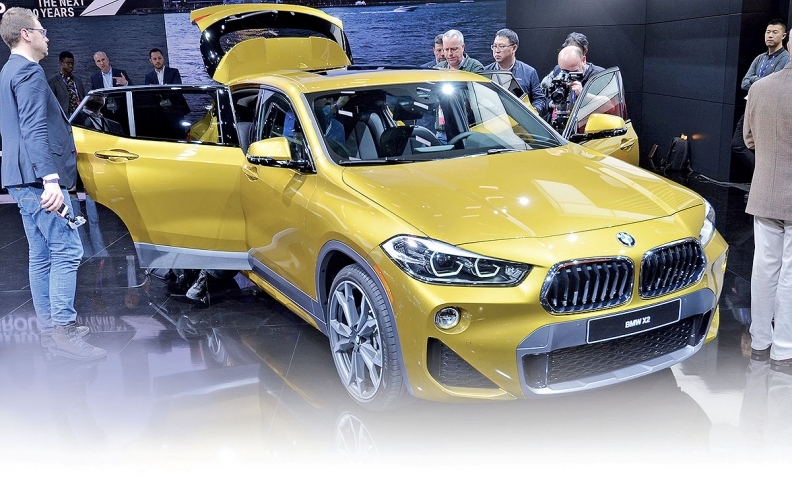 BMW showcased the X2 xDrive28i in Detroit. DETROIT — BMW will add a front-wheel-drive variant to the new X2 subcompact crossover family just a couple of months after the all-wheel-drive debut model reaches U.S. dealerships in March. That awd model, the X2 xDrive28i, powered by a 228-hp, 2.0-liter turbocharged four-cylinder engine, was BMW's showcase vehicle at the Detroit auto show last week. Coming later in the spring will be the X2 sDrive28i, the fwd variant, said John Kelly, product manager with BMW of North America. Although the X2, with its raked-back coupe styling, is slightly smaller than BMW's X1 entry-level model, it will cost more. The awd X2 will start at $39,395 including shipping, about $2,500 more than the equivalent X1. The fwd X2 will cost about $2,000 less than the awd model, Kelly said. BMW is positioning the X2 as a sportier alternative to the X1, which tallied sales of 30,826 vehicles in the U.S. in 2017. Company executives aren't sharing sales projections for the X2, but they expect it to be a profitable addition to the lineup that conquests many of its customers from other automakers. "Take an X2 — this is a car that will contribute an above-average contribution per unit," Nicolas Peter, BMW Group's finance chief, told Automotive News. Bernhard Kuhnt, CEO of BMW of North America, said the automaker expects a majority of X2 buyers will be new to BMW Group brands. "It's a cool looking vehicle," Kuhnt said. "We expect high conquest rates with it. The reception from the dealers and focus groups of customers [have] made us very optimistic." BMW isn't specifying a target age range, but the X2 is expected to draw customers who are younger than the brand's average buyer. In the U.S., that average is the upper 40s, Kuhnt said. Marketing efforts for the X2 will center on web-based advertising, particularly social media, Kelly said. The X1 and X2 will be the only BMWs in the U.S. based on a fwd platform. They share BMW's UKL fwd platform, which also is used by Mini. Despite the shared platform, the X1 and X2 have different styling and body parts, though the door handles and antenna are shared, Kelly said. The X2 is shorter and lower than the X1, with a different face. Designers have turned BMW's iconic kidney grille upside down on the X2. It is the first modern BMW with this grille design, the company has said.